Remember your Las Vegas wedding with an exclusive Chapel of the Flowers wedding keepsake! Couples have the option of adding our premium wedding gifts to their wedding package now or stopping by our gift shop while on property. Our Champagne bottles, shot glasses and flutes make excellent wedding favors or "thank you" gifts for your wedding guests. Ask your wedding planner about our keepsake items and how you can include them in your Las Vegas wedding package! You and your guests will be cool, calm and collected with our wedding fans. These wooden laser-etched fans are ideal for summer weddings in Las Vegas. Whether you are having an outdoor ceremony or want to give your guests a stylish souvenir, they will love this thoughtful gift. Celebrate with a Bottle of Moet and Chandon Imperial Brut Champagne, along with a pair of Chapel of the Flowers etched toasting flutes, for the happy couple to celebrate in style. Remember your Las Vegas wedding with a bottle of California Sparkling Wine with a rendering of the world famous "Welcome to Las Vegas" sign, for the couple to keep as a memento of their Las Vegas Wedding. Set also includes a pair of Chapel of the Flowers etched toasting flutes. Commemorate your love with two small, 187 ML bottles of California Sparkling Wine, each reading "Welcome to Las Vegas," along with a pair of Chapel of the Flowers etched toasting flutes. Perfect for anyone! One bottle of non-alcoholic Sparkling Cider, with a pair of Chapel of the Flowers etched toasting flutes. 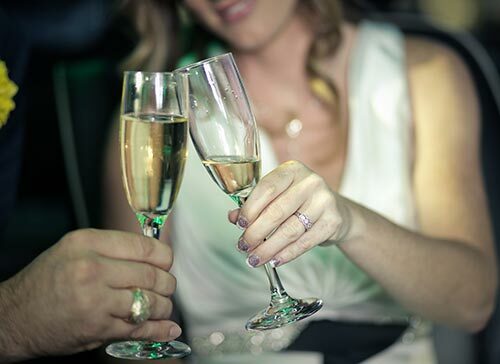 A premium bubbly, for a once-in-a-lifetime occasion. Your celebration deserves the best champagne in the world –Cristal! Toast to a lifetime of love and happiness with a bottle of Louis Roederer's best. Award-winning champagne for your special day. If you enjoy a dry bold champagne then raise a glass of Dom Perignon Brut at your wedding reception. One of Napa Valley’s finest wines. Indulge and cheers to your love with a sophisticated bottle of Caymus Cabernet Sauvignon. Toast with our finest selection of Champagne! One bottle of Moet and Chandon Imperial Brut Champagne. Glitter and Fizz! The ultimate wedding gift for the happy couple. Congratulate the newlyweds with a bottle of One Hope Sparkling wine. A dazzling bottle of California wine for the newlyweds. Pour, sip, and celebrate with a bottle of One Hope Sparkling wine with a silver glitter bottle. This rose-tinted sparkling wine is perfect for those that enjoy the crisp and light flavors of tart red currants, pomegranate, berries, peaches, and cloves. Sonoma Valley grown, this rare find will captivate any wine lover with flavors of apple and apricot. Savor the moment with a bottle of BR Cohn Cabernet Sauvignon. Your taste buds will be delighted with the bold and rich aromas of this Sonoma Valley wine. Perfect gift for “Something Blue,” this Tiffany’s teal bottle of sparkling Moscato is part of the Gemma di Luna’s Italian Luxury Collection and will add a burst of flavor to captivate any lover of sweet wines. Cheers to many happy years! Known for its Belgian Dark Ale, this reserved label on Chimay will please any beer connoisseur. Classy and refreshing, this bottle of Sables D'Azur Rose will simply delight anyone who takes a sip. Individual sized bottle of Moet Imperial Brut is a perfect size for a guest favor or glass for one. Perfect for sharing, celebrate your Las Vegas wedding with your loved ones. This product includes four 187-ML bottles of California Sparkling Wine with a rendering of the world famous "Welcome to Las Vegas" sign. Share your wedding celebration with six 187-ML bottles of California Sparkling Wine with a rendering of the world famous "Welcome to Las Vegas" sign. A sparkling toast for those who want to celebrate without the alcohol. This sparkling cider is a great treat for the whole family. Exclusive Chapel of the Flowers etched shot glass are excellent mementos to take home to remember your special day. This will be your favorite coffee mug. This adorable heart-shaped handle mug is great for that morning cup-of-joe, or perfect for hot chocolate on those cold winter nights. Sleek and stylish – your hot and cold beverage will be the ideal temperature for your enjoyment. The tapered tumbler is the perfect shape for your car cup holder and has a stainless-steel exterior with Chapel of the Flower logo. Tumbler is approx. 6.5” tall with a spill proof clear plastic lid. Cheers to Love! Toast to your happily ever after with our toasting flutes engraved with the Chapel of the Flowers Logo. Price listed is for a single flute. Modern take on a classic gift. This modern flask is a stylish option to hold your favorite drink. Toast to love and happiness with our elegant Chapel of the Flowers 9 oz. stemless wine glass. Salute! Pour your favorite brew in our souvenir Chapel of the Flowers 16 oz. beer mug. Keep cool with our limited-edition Chapel of the Flowers baseball cap. Available in white and black. Whether you are working up a sweat at the gym, or running daily errands; our Chapel of the Flowers sports bottle is sure to keep your beverage nice and cold. Get the complete bridal look with a garter! Whether you will toss it to your single ladies or keep it for yourself, the garter is a traditional touch for your wedding wardrobe! Beautiful flower girl baskets available in white and ivory. Silk petals purchased separately. Always remember who was at your Las Vegas wedding! Our fancy guest book will allow your guests to sign-in for a record of all your witnesses. Jot down a "honey-do" list or use at the office. This keepsake journal is perfect for everyday use. Purchase in the Gift Shop or add to your cart to pick up with you arrive. Available in black or white. License to wed! Take home this wedding keepsake, and let everyone know you got married in Las Vegas. This novelty license plate also makes a great prop for post-ceremony photo sessions. Adorn your license plate with this Chapel of the Flowers license plate frame. Never lose your keys with our elegant heart-shaped key-chain with Chapel of the Flowers logo. Party just a little bit – take your favorite beverage to-go in this mini flask key-chain. Make sure you’re always looking good with our flip mirror key-chain and mini picture frame. Check it out! You will always be looking good with our flip mirror key-chain and mini photo frame. Love is brewing! You will want to start every morning with our finest blend of aromatic coffee. Grab a 4 oz. bag today! A timeless keepsake from your wedding at Chapel of the Flowers that can be used on your wedding cake during your Las Vegas wedding reception. Decorate your wedding cake with our elegant hearts cake topper! Ask your wedding planner about our delicious wedding cakes to add to any wedding package. Remember your trip to Las Vegas any time you open your favorite bottle of wine. This stainless-steel wine bottle accessory and tool set includes bottle opener/corkscrew, wine stopper, drip ring, and pourer with the Chapel of the Flowers logo. A glass rose is forever! Remember your very special day with a keepsake that you will cherish for a lifetime. This delicate glass blown rose will remind you of your Chapel of the Flowers wedding. Celebrate your wedding with bubbles! Whether you want to take fun wedding photos including bubbles, or have kids in the wedding party to entertain, our wedding bubbles are a great souvenir. Exit the chapel surrounded by bubbles! Purchase this box set of bubbles, so that your wedding guest can blow bubbles as you leave the chapel. Just a little luck! Ring this silver bell for good luck as you exit the chapel. Need more than just one? Buy a box of 24! Ringing bells is a way to wish newlyweds good luck! Buy a box of wedding bells to give to your wedding guests to wish you all the luck in the world! These popular white flip flops are the perfect escape for your feet after a day in wedding shoes. Available in s, M and L.
Our groom socks will add a touch of fun to your wedding attire and keep your feet from getting cold. Your friends are the best, and you know it! Add some personality to your groomsmen attire with these fun socks. Laugh your way to the altar with these “Game Over” socks. Make a statement and show your Vegas pride with these Las Vegas socks. Reminisce in all your wedding memories with our “Adorable” ScentSticks. Inspired by our Victorian Chapel, the royal blend of red berries, jasmine, violet and rose petals with exotic sandalwood and vanilla create a rich and luxurious atmosphere to any space in your home or office. ScentSticks are the same fragrant that is in the Victorian Chapel, and includes 25 pre-scented ScentSticks with decorative metal vase. The sweet scent of love is in the air every time you breathe in this “Black Orchid” fragrance. Lavish in the blend of lush green and floral notes paired with the richness of amber, nutmeg, and orchid complemented with a musk-like essence. ScentSticks are the same fragrant that is in the Magnolia Chapel, and includes 25 pre-scented ScentSticks with decorative metal vase. You will be reminded of your first kiss in the La Capella Chapel every time you smell these ScentSticks. If you got married in the La Capella Chapel, this is the perfect keepsake to remember your special day. The “Mountain Point” scent is created with airy marine notes combined with freshness of cucumber, sweet melon, rose and lily of the valley. ScentSticks are the same fragrant that is in the La Capella Chapel, and includes 25 pre-scented ScentSticks with decorative metal vase. Take a stroll down memory lane every time you to take in the fresh aroma of these ScentSticks. You will be reminded of the rustic venue of the Glass Gardens as you take in the subtle “Apple & Oak” scent of juicy honey crisp apples blended with spiced pear undertones of flowers, smoked oak, and sandalwood. ScentSticks are the same fragrant that is in the Glass Gardens, and includes 25 pre-scented ScentSticks with decorative metal vase.